The beauty addict in me squeeled in delight when I saw this on my January-February BDJ Box. But procastination got the best of me and I've put aside reviewing this product. But not that I wasn't using it. On the contrary, I've used this several times. Based on the Avon brochure I saw online, this CC Cream falls under their skincare Anew 360 White. That's Avon's famous whitening line. That suggests immediately that this cosmetic also has skin care benefits, primarily whitening, lightening or brightening. Not that I was looking for a cosmetic product that brightens the skin, Avon got me hooked on this already by the mere mention of CC Cream. Because CC Cream is love! After my failed attempts with BB Cream, CC Cream was a dream come true. They provide better coverage and correction but still packed with sdkin nourishing ingredients. Avon 360 White 15-in-1 CC Cream SPF 30/PA+++ feels and looks like a foundation. CC Cream for me is crossbreed between a foundation and a BB Cream. Taking what's great in both products. CC usually stands for Complete Coverage, Complete Correction, Color Control, or Complete Coverage. But whatever the meaning of CC Cream, I think it is best option for Filipinas, more so than the BB Creams, since it's most concentrated in reducing the appearance of oiliness. Given that most Pinays suffer have combination to oily skin, this is a better choice. CC Creams are also concentrated in evening out the skintone which benefits most of us who suffer from hyperpigmation caused by sun damaged or post acne marks. The good thing about CC Cream is the benefit of skin care ingredients in it. Which makes it a better alternative to a regular foundation or tinted moisturizer. In this instance, Avon melded the science of their Anew 360 White with the CC Cream allowing this product to give more benefits. 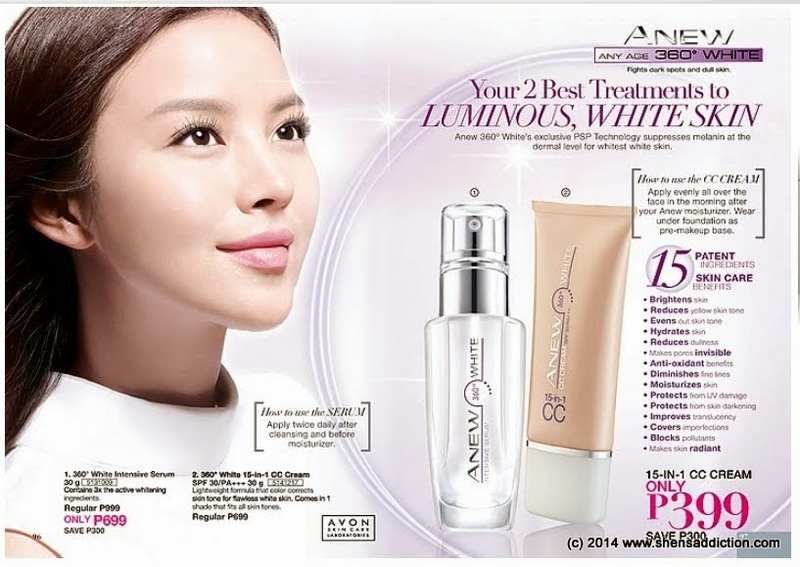 Avon 360 White 15-in-1 CC Cream SPF 30/PA+++ has a warm neutral shade that matches well on fair to medium skin tones. It feels lightweight and it melds on to skin well using either fingertips or a foundation brush. I'm definitely loving the effect. I admit, I didn't expect this product to work so well. It successfully evened out my skintone, reduced redness and covered some of my more pronounced active pimple. 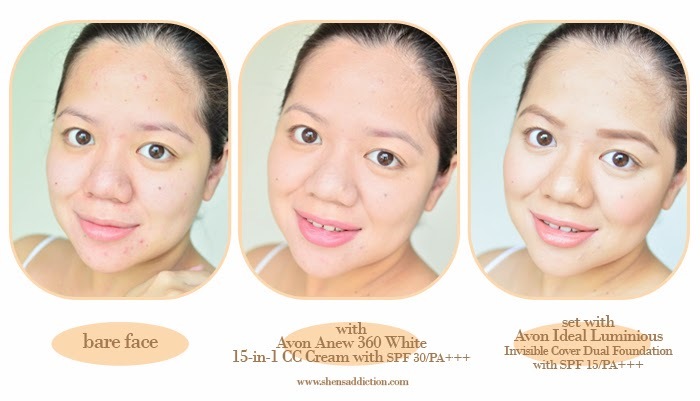 I didn't use a concealer for the undereyes and pimples prior to applying the Avon 360 White 15-in-1 CC Cream SPF 30/PA+++ but it looks as if I did! It instantly brightened my face and gave it the matte effect that I want. Appearance of pores have lessened just by the CC Cream alone. This is the result minutes later from my finished base. This is how it looks 30 minutes or so after I did my eye makeup. I seriously thought something was wrong with my camera given how flawless my face looks! But the combination of the Avon 360 White 15-in-1 CC Cream SPF 30/PA+++ and Avon Ideal Luminious Invisible Cover Dual Foundation SPF 15/PA+++ was just too perfect! It made my look flawless and indeed, luminious. It looks as if I photoshopped my skin but I didn't!